Q: As we commemorate 100 years since the use of chemical weapons on the battlefield, do you think that CBRN is particularly relevant as we move forward in the 21st Century? A: The 1st World War introduced us to the deliberate use of chemical weapons on an industrial scale; the first attack on the Western Front claiming the lives of more than 1,000 and injuring another 4,000 unprotected soldiers. It was a defining event that still resonates in the 21st Century. It is pertinent that the two major wars of this century, the Gulf and Afghan wars have both been attributed to the prevention of the use of CBRN weapons. Contemporary events in Syria captured their barbaric use against the innocent and unprotected, while we now have a situation where we have ‘ungoverned space’ in the Middle East, in North, East and West Africa occupied by a network of radicalised non-state organisations. They are not bound by international convention, neither are they accessible through formal channels of communication and diplomacy, and as has been tragically demonstrated, they have no respect for life, cultural diversity and basic humanitarian norms. It is a concern that they have access to toxic industrial chemical, biological and radiological materials. Ungoverned space does not just apply to the land environment; we have several instances of the hijacking of container ships and chemical tankers in the maritime domain, while the proliferation of unmanned aerial systems is also cause for concern. So to answer your question, CBRN protection has never been more important and we should not just consider deliberate release, but also release through accident, natural disaster or neglect. GSReS contains all the major features of GSR including its ‘teardrop’ canister, but adds to them by incorporating the additional options of using circular CBRN and Toxic Industrial canisters, Powered Air Purifying Respirators and Self Contained Breathing Apparatus. Q: Turning to Scott Safety and your engagement with Defence. Could you tell me a bit about the company and where you are in terms of your military product range? A: Scott Safety, a Tyco International company, are global leaders in Respiratory Protection Equipment (RPE) with our main Military and Civil Defence manufacturing plant based in Lancashire, United Kingdom. Our product range includes military and civil defence masks, filters, powered breathing, self-contained breathing apparatus and escape systems. 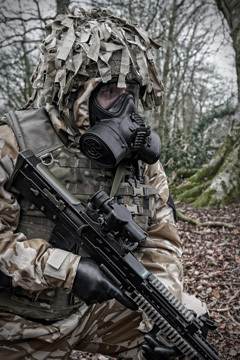 Our expertise, at the cutting edge of RPE technology, has been further developed in collaboration with the UK Ministry of Defence who accepted the Scott General Service Respirator (GSR) into service for their Air, Land and Naval forces in 2007. Since then, we have produced the GSRe, the export version and the multi-functional GSReS which offers the specialist end user modular breathing options from filter canisters to Self Contained Breathing Apparatus from the same mask platform. Q: What sort of areas have you focused on in ensuring that you are keeping up with the demands of current and future threats? A: While respiratory protection is there to save life and prevent injury, it must also enable you to carry on and do your job in a contaminated environment. Dealing with the former, an enormous emphasis was placed on achieving a very high PF ‘protection factor’. After extensive tests and trials we developed dual seals for face fitting and an inner oro-nasal mask and filter. 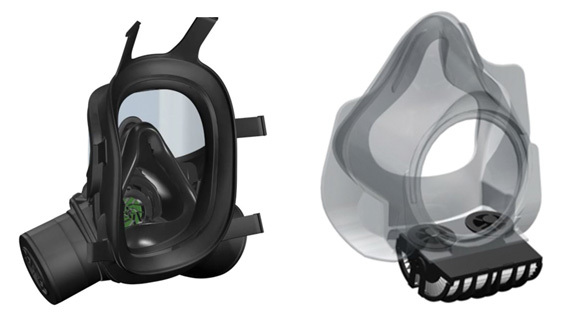 As a result, we now have the highest available PF on the global market for a face fitting respirator, protecting the next generation against future threat agents. With regard to doing the job, as in all modes of physical protection, reducing the physiological and psychological burden has been extremely important. Maintaining situational awareness is essential, especially at night and in urban environments, so the single rather than split ocular visor certainly helped there. The ability to deal with the build-up of moisture and perspiration was also seen as a major improvement; hitherto you either swallowed your own sweat or broke the mask seal to empty it. The ‘dual seal’ enhanced user comfort, assisted regulation of air pressure at altitude and supported protection against spontaneous breaching that may arise due to the percussion effect generated when firing weapons. User confidence was also supported in designing a mask to enable canisters to be removed and changed without fear of ingress of CBRN agents; a drill that hitherto carried adverse psychological effects especially under stressful life threatening conditions and at night. For the specialist operator, we have also viewed the respirator as a platform in its own right, so that with the GSReS, the operator has the option to immediately switch from negative to positive air pressure, in layman’s terms from switching from the canister to using air powered remote filters or portable air tanks without having to change respirators. Scott’s dual seal technology, oro-nasal protection and secondary filtration. Q: You mentioned design, but how does a commercial entity make the transition from design and production to use on operations? A: That is a good question, in so far as the respirator is probably the best example of a piece of equipment that is fielded to every single member of the Armed Forces, more so than a rifle for instance. To get there, we had to work intimately with the End User to test and prove, in every case, that the equipment does what it is supposed to do for each individual regardless of their service, combat arm or role, under realistic operational conditions in any physical and climatic environment, anywhere in the world, by day and by night. By way of example, three extreme hot weather trials were undertaken in the Australian outback and the United States, while cold weather trials took place in Norway. While a much lower breathing resistance proved a significant benefit, soldiers were also able to drink four times as much water wearing the new respirator. On the other hand, we also had to address the full range of physical facial features that one finds across the Armed Forces globally, so all shapes, sizes and ethnic backgrounds were catered for. The whole process sounds like and indeed it was a huge undertaking. It was a deliberate process and it took time and resource, but that is a small price to pay to generate operator and leadership confidence when you are relying on the equipment to save your life and maintain mission orientation. Crucially, good CBRN protective equipment not only provides assurance, it is also serves as an important deterrent in signalling intent to a potential adversary that you will ‘survive and operate’ in a CBRN environment. Protecting the operator in all environments is our priority now and in the future. Photo: Crown Copyright MOD. Q: What about the future? A: Preparing for the future is extremely important, not just within the company, but across the Tyco Group. 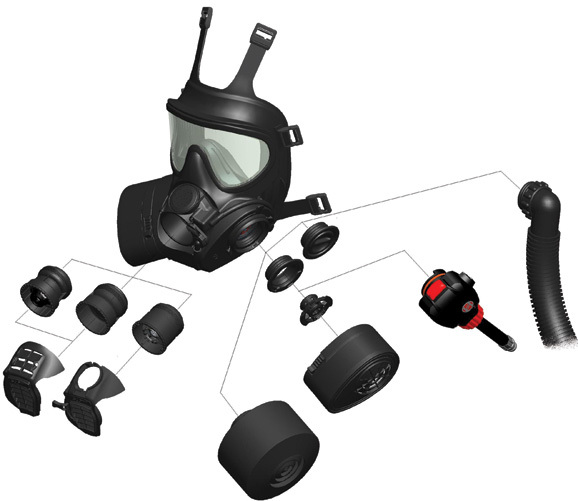 In the defence and civil defence sector, given the increasing sophistication of User platforms and the technology that has come into service, and will enter service in the future, we have to think of the respirator as a platform in itself, so that it is compatible with multiple types of communication, sensor and visual aids and not just other types of breathing apparatus. Given the pervasive nature of CBRN and its ability to impact across a wide spectrum of operations at home and abroad, we are collaborating with our fellow colleagues in the Defence and Security sectors who are themselves either improving or developing new equipment and platform solutions. We are also looking at ensemble solutions, where we supply a range of personal protection, sensing and decontamination options to the end user. From the future concepts and doctrinal perspective, we place great emphasis on thinking strategically, on maintaining knowledge of the contemporary and future operating environments, for instance, the shift towards complex and inter-agency operations in urban and semi-urban terrain. Finally, the company is driven by innovation, while as part of our philosophy we have always ensured that we take the operator with us on our research and development journey. As we move forward, this will ensure that our solutions remain practical and relevant when the operational situation is complex, physically demanding and life threatening. Brian Clesham was the senior dedicated CBRN staff lead for the British Army when the GSR was being brought into service. He is a former Chief of Staff of the United Kingdom’s Defence CBRN Centre; Course Director within the Joint Operations Department of the NATO School and graduate of the NATO Defence College.